Can You Tell a Moose Age by its Teeth? Is it not possible to tell the age of a moose by looking at it's molars? I was told it's the only way to tell right age. Yes Llewellyn, you are quite right. The only way to be certain of the age of a moose is by looking at its teeth. Often biologists will request to look at your moose teeth when you go through a game check. It is through the observance of the wear on the molars that the age of a moose can be accurately determined. 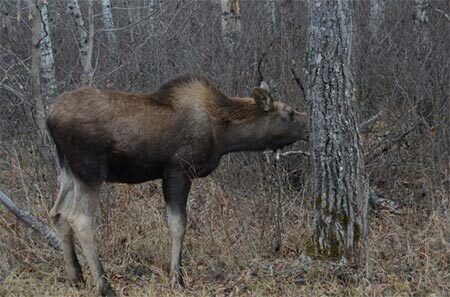 By cutting the cheek to have access to the teeth, wildlife officials may be able to determine a moose age by its teeth. However; there is a more accurate method which involves removal of a incisor tooth. The incisor teeth are the front center two teeth in the lower jaw of a moose. The tooth is removed by cutting through the gum line on either side of the tooth, down as deep as you can force a knife. Then with your thumb pull the tooth out and downward to pull it free. Once free of the jaw the tooth is scraped clean of gum tissue. Once removed a biologist can age an animal by sectioning the incisor tooth and counting the layers of cementum. This process is going to be done in a laboratory setting, not in the field. In British Columbia the wildlife branch collected the incisor teeth from ungulates for many years. 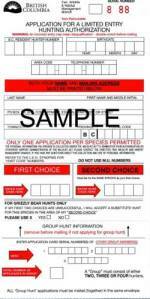 They used this information along with other harvest data to determine the health of various big game herds. 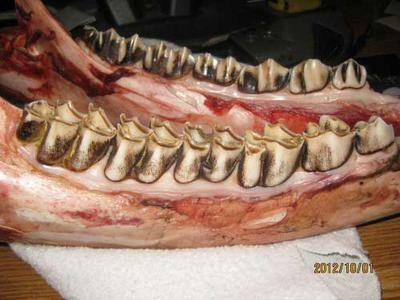 The following document created by Bill Jensen Aging Moose By Teeth will shed some light on the process of using molars to judge a moose age by its teeth. We've been trying to solve a mystery. There have been no sightings but all sorts of "evidence" of a large hooved animal around the perimeter of our property. Poop had been appearing almost daily for a week, then none for 2 weeks, then some a couple of days, then none for quite a while. Yesterday, my husband went out to feed the birds and found a fresh pile 10 feet from our back door RIGHT ON the property. 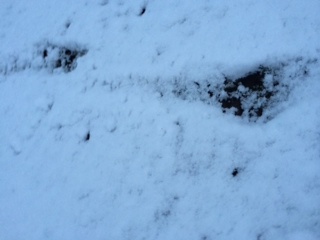 On one occasion, there were tracks left in the snow appearing to be hooves, but dragging marks between them. We live in rural Ontario right beside about a 10 acre swampy low land area. We think the animal comes out of the marsh, goes to the toilet and retreats back to the marsh. But this time, coming right onto the property.....how could we miss a moose? Would it come out in broad daylight and would it be alone? We just moved in in July. The droppings started to appear in mid-late October. There are horses and cattle near, but not in the immediate vicinity. The ones the closest are penned and accounted for. If it is a moose, would it be coming so close to the house and when would be the best time of day to watch for him? PS: We so do not hunt. We would love to photograph him. Comments for Are moose solitary? Wow Lee, you pose quite a mystery there! It would help a lot to see a picture of "The Pile". The tracks with the drag marks almost look like cattle to me, but I can't be certain. There is a definite difference between cattle, horse and moose poop so a photo would solve "what kind" of critter is visiting you. Now as to the question are moose solitary? 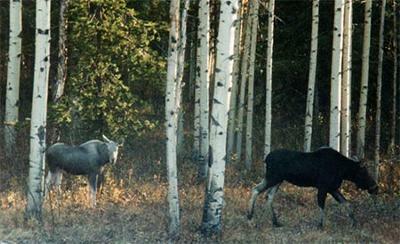 The season will determine if moose are solitary. Moose are typically not gregarious (IE: don't gather in herds like Elk) but they will group together at certain times of the year. Cow moose will travel together with their calves for up to two years and sometimes separate groups of cows and calves will be found in the same area. 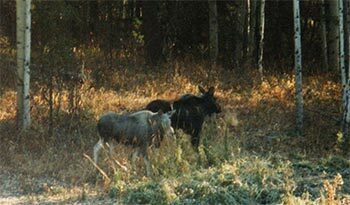 However, bull moose are loners for most of the year but will form bachelor herds after the fall rut. Moose will be most active from daybreak until mid morning and then again from mid afternoon until dark. That will be the best time for photo opportunities. One suggestion I have for you is to get a trail camera. 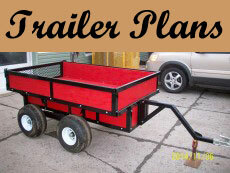 Set it up near where your visitor arrives or leaves. 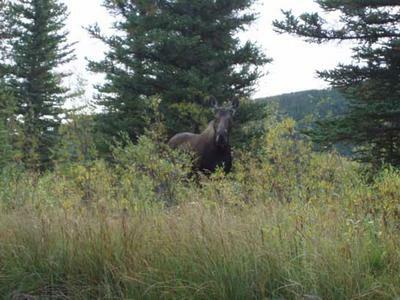 If it is a moose, he/she will most likely be back if he/she hasn't been disturbed. The beauty of trail cameras is they take pictures or videos even when you are not there. Your visitor definitely could be a moose. 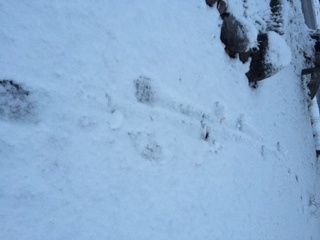 The photos of tracks you sent are not really clear enough for me to say for sure. What are the dimensions of a moose calf at birth, six months, one year? 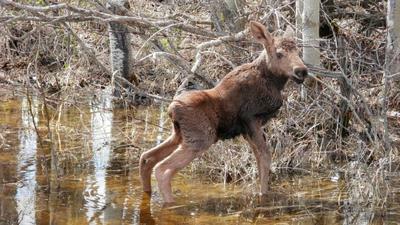 Moose calf growth begins at birth and accelerates as development occurs. At one month in age a moose calf is about 110 cm in length and weighs about 20 kilograms. At three months in age a moose calf is about 187 cm in length and weighs about 110 kilograms. At five months in age a moose calf is about 210 cm in length and weighs about 180 kilograms. At seven months in age a moose calf is about 200 cm in length and weighs about 160 kilograms. The drop in length and weight of moose calf growth is attributed to lack of nutrition during the winter months. At nine months in age a moose calf is about 195 cm in length and weighs about 150 kilograms. At eleven months in age a moose calf is about 200 cm in length and weighs about 160 kilograms. At thirteen months in age a moose calf is about 205 cm in length and weighs about 170 kilograms. At seventeen months in age a moose calf is about 250 cm in length and weighs about 275 kilograms. At twenty-one months in age a moose calf is about 265 cm in length and weighs about 255 kilograms. At twenty-seven months in age a moose calf is about 275 cm in length and weighs about 325 kilograms. At twenty-nine months in age a moose calf is about 275 cm in length and weighs about 350 kilograms. 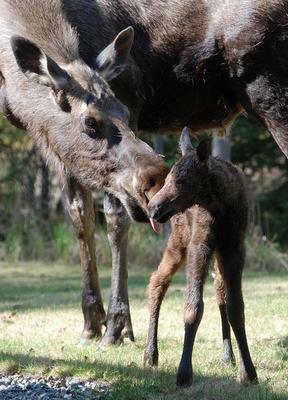 Cow moose and bull moose calves grow at about the same rate with average weight gain of 1.3 to 1.6 percent per day. This growth rate continues until approximately 150 to 165 days. Vince Crichton tells me he has measured moose in early December (about 6 and a half months) they measured in height from top of the hump to tip of the hoof – the average is 146 cm (range 139-160). This moose is about six and a half months old. The moose calf growth rate changes at that point because of breeding season and forage quality. 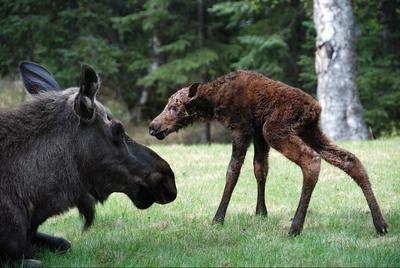 The decline in growth is a phase that will repeat itself through the balance of the calf moose life cycle. The main difference between cow moose calves and bull moose calves at this point will be the decline in growth rate for cow moose calves is two times greater than that of bull moose calves. The consequence of this growth pattern in cow moose is they will reach their maximum body size earlier in life and weight much less than that of bull moose. Bull moose reach their peak weight just prior to the breeding season and have their lowest weight at completion of the rut. Whereas cow moose reach their peak weights much later during the winter and have their lowest weight just after giving birth in the spring. 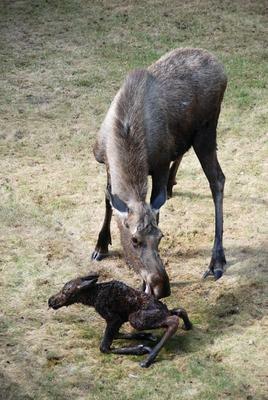 From the time moose calves are born they will gain and loose weight according to the various seasons and forage quality. 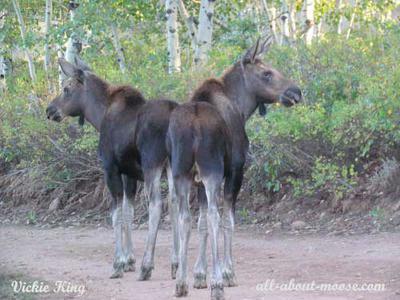 Moose calves born as twins will weight considerably less than those of a single birth. Information from the Alaskan/Yukon subspecies indicates that twins will weigh13.6 kilograms and single born moose calves will weigh 16 kilograms. Males do not weigh more than females at birth but the bull moose will weight 50 percent more than the female at maturity. Moose calf growth is a cycle that is predetermined and varies with the seasons. The growth patterns are assumed to be the same amongst the moose sub-species. Did we hear a moose? We live just outside Farmington, Maine. Around 1:00 this morning (19 Jan 2018), we were awoken by something that sounded like a combination of a cow and a snowmobile. It would sound for a second or two or three, then stop, then repeat, and it definitely sounded like it was moving deeper into the woods around the house. We are surrounded by woods, and there is also a small dairy farm down the street from us. I didn't think moose were particularly active during this time of year, but when I listened to some sounds on YouTube videos, they were strikingly similar to what we heard. Sue, you most likely did hear a moose! Without hearing the sound, of course I can't be positive, but if you have moose living in your geographic region what you heard was most likely a cow moose searching for its calf. They were probably separated and she was bellowing and calling for her calf. It would be last years calf as it is too early in the season for a calf from this year. A few summers ago we had paddles into Lake Missanaibi in northern Ontario. After making camp we became aware of a visitor, a cow moose, that circled our campsite for many hours...walking most of the time but also trotting at times....and frequently bellowing, staying two to three hundred feet at all times. Any explanation for the behavior? Newborn calf moose when laying down can be almost impossible to see, more than likely the cow had a calf moose hidden in the bushes nearby and she felt you were too close to it's proximity. She would rise up and strike with her front hooves, easily able to cause serious injury or death. A couple of young bull moose that are not showing any spring antler growth. 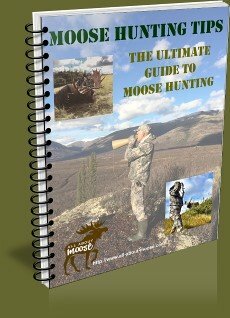 I'm have a question about moose in captivity. If the male doesn't lose his antlers when he should and still hasn't lost then in April or May, what can we do? Is there any way we can help him speeding up the process? I've heard about saw off the antlers? Is that an option and how do that work in that case? I have been looking for scientific articles about this but don't seem to find any. The casting or dropping of antlers by moose in the spring is a natural occurrence. The dropping is actually caused by one or two things. First, the older antler will have the tendency to drop on its own as the connection between the skull and the antler base weaken. If the male moose has large antlers, gravity will often help this along. 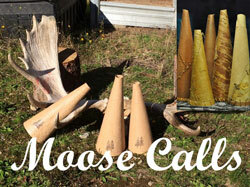 In our area mature bull moose drop their antler long before their younger counterparts do. The occurrence of antler casting is often well in advance of any visible new antler growth. Secondly, in spring the new antler will begin to grow. This will push the old antler away from the skull and cause it to fall away on its own. Even if you were able to contain your bull to saw off his antlers. You are not going to help his cause. Besides increasing his stress level to do so, the advantage of gravity to help the old antlers fall off will be lost. I am wondering if moose have fleas. I recently was on a moose hunt and after handling a moose carcass, had bites in areas where fleas would likely bite - creases where clothes are tighter fitting . I am just wondering if I should check the bedding where I stayed. Possibly bed bugs? Geesh! Or maybe just black flies. You have asked a great question Wendi! I have handled over 25 moose carcasses over the years and I cannot say I have ever found fleas on them. Tics yes. Black flies can be a real problem too! I recently returned from a northern trip where, once the daytime temp rose the flies came out in numbers. The flies I speak of are small... maybe 2 or so mm long. But man can they bite. They especially like to get into the creases you speak of. I think this is a survival instinct for them, it is hard for an animal or human to rid themselves of these little creatures in those tight areas. In animals they like to get in their ears. Now bed bugs... yuk! A possibility, but would vote for the flies. Those flies love the swamps, and love to eat us! I have posed your flea question to a moose biologist friend of mine... I'll post his response once I receive it. Comments for Do moose have fleas? OK, I'll go with the black flies. I know they were swarming around and I did get bit on some of my open areas - hands, face - but didn't know they would sneak into the hidden creases. Ha ha. Thanks for your help. I think we are going up one more day to see if we can wrap it up in this early season. If not, late season, it is....and I don't think we will have to worry about bites then. It has been an extremely nice fall here this year. It is amazing actually where those little buggers can get. I remember a few years back getting bites around my waist, right where my shirt tucked into my pants. They would have had to get into my shirt, likely around my neck then climb or fall all the way down. Once nestled in they could chew away. I had little red welts around the waist area. I normally don't react to bug bites... but that year my forearms had huge welts on them. I figure they had been on the carcass before they bit me... ouch! Probably an rejection from the moose blood. My friend, Dr. Vince Crichton has confirmed there are no fleas on moose. Bull Moose early in the year. Are moose territorial? No, not in the same sense a bear or a pack of wolves are. They do not rule over X number of square miles or kilometers but moose do have a Home Range in which they live. Will moose defend their location against other intruders, yes. It has been better described as "temporary expropriation of ground" because it is only during certain times of the year where a moose will defend its current location. The two main periods and locations in question are during calving season and during the rut. During the calving season a cow moose is extremely sensitive to any and all intruders into her temporal space and will defend the area and her calf vigorously. However, this defense is more about calf protection than territorial rights. During the summer, cow calf groups always have an area of defense about them in which they will not allow a bull to approach. This area diminishes as fall and mating season approaches. Again, the area is not defined by solid boundaries but more an area of protection that follows the group of animals about during their daily lives. 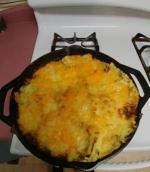 The other case is to be made for bull moose during the rut. The "territory" is deemed to be the area surrounding its harem or mate. A bull will for certain challenge any suitors that may try to upset his dominance. He is defending his mate not so much an area. In both these cases the moose territory is only temporary. During the remainder parts of the year bulls often congregate together in bachelor groups and cows and calves are frequently found together. When we lived in BC, moose were regular visitors to our acreage... bedding down in the thistle patch right beside the house. One fall a momma brought her calf and he was a beautiful silver colour. Is this colouring very common? Do they remain silver or change to brown as they get older? Late Addition: Here are some pictures of the silver moose calf I wrote you about. We lived in the south east corner of B.C. in the Elk Valley between the towns of Sparwood and Elkford. I can't say that I have ever heard of a silver colored moose. White moose, yes... even brown with white patched moose, similar in coloring to a pinto horse. The white and or albino moose are not very common in BC. Although they are here and are scattered across the northern hemisphere. I don't suppose you have any pictures of the silver moose? Where in BC did you live? Maybe some of our other website visitors have seen this very different coloring of moose. I've never heard of one Mark, but it sure does sound cool. Every once in a while nature gives us an anomaly just to spice things up I think. The piebalds and the albinos are always interesting to see, for sure. I hope you can get some photos to share. That would be cool. I have seen greys, old moose, but never a silver. I would like to see a picture. "Another example of God's art eh buddy. :)"
You got that right Steve! I wonder if this calf, because she was a newborn had short shiny hair just giving her the "silver" look. Even so, what a rare and beautiful moose she must have been. I once saw a picture of a cow moose, where her back was completely blonde; as though she had been to the hairdresser! Bleached from the sun or natural, I am not sure. 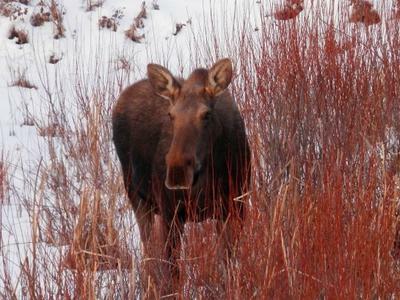 Although your moose is fairly uniform in color, it is entirely possible that the moose is infected with winter ticks. Winter ticks have started to become a widespread problem south of the 60th parallel and there are many provinces and states that are studying the problem. 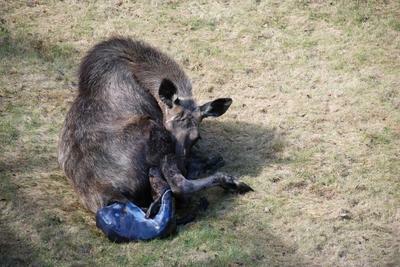 Some moose that have large numbers of winter tics will rub their hair so vigorously trying to rid themselves of these pests that the ends break off. These moose will have a white or ghost like appearance. It has been hypothesized that the winter tick is spreading because of global warming. Are there Moose in Arkansas? I live in the NW corner of Arkansas and few days ago someone living in same town as I do posted a picture of a female moose and stated he saw her at one of the small lakes not far from here. I have never known moose to come this far South. Do you think it could be true or is he pulling a hoax? Bird Girl, that is a great question! Let's have a look at where moose have historically been found in the southern USA. Moose go into heat stress at temperatures above 65 F, with warm temperatures that are found in Arkansas I think that moose would find the climate uninhabitable. I suppose anything is possible. Realistically though, I don't think moose will be found that far south. 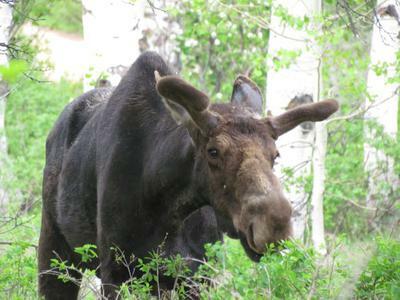 Moose have been seen as far south as Northern Utah and Southern Colorado due to relocation efforts during the early 1990's. During the winters of 1991 through 1993, 106 moose were released near the Upper Rio Grande River and have established a herd there. Basically following the Rocky Mountains as habitat. Looking North from Arkansas, the closest moose sightings will be in The Dakota's, Minnesota, Wisconsin and the UP of Michigan. However; moose have, over the past many years been expanding their range to areas where historically they were not found, but as far south as to find moose in Arkansas? I would need more than a post on social media to believe that is true. Comments for Are there Moose in Arkansas? I would say by looking at the willow and the type of trees in the photo it is of more of a northern look. If there is that type of terrain then it could be true. If there's elk around there moose sighting could be possible. Good call Kapow. The photo we used is from near Yellowknife in NWT, Canada. If the statement about Elk is true, I know for a fact there are Elk in southern Missouri. A young girl just got into some hot water for killing one during deer season. Arkansas wouldn't be a stretch. I found this antler while hiking in the mountains in Colorado. I am having a hard time identifying what type of antler this is. It appears to be the wrong shape for an elk, and far too big to be a deer. My uncle thinks it's a moose, what do you think? It's perplexing me. 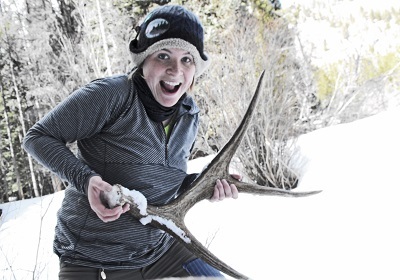 Thank you so much for thinking to ask us to identify the antler you found. Your uncle's guess is correct, that is definitely a moose antler. The antler is probably from a younger bull moose,around 1 1/2 to 2 1/2 years of age. It is also entirely possible that the antler is from an elderly bull as well. One that is well beyond his prime and has started to loose the ability to grow antlers well. Most likely though a younger bull. Congratulations on a great find! Lots of people go into the woods hoping to find antler sheds and come up empty handed. You did well to find this one. Keep looking in that area, you may find the matching one too. Hopefully before the rodents do.